Estrofy is a dietary supplement that is designed to promote hormonal balance in females. It claims to increase the level of estrogen in your body. This may help to improve your mood and energy. Hormonal imbalance might be as a result if different factors. This might be controlled by use of different ways such as changing your diet or use of dietary supplements. Estrofy is one of the supplements that may help to restore hormonal balance. If you are interested in this product, you can purchase it from the brand’s website or other online retail stores. The manufacturer of Estrofy supplement is VH Nutrition Company. The company claims to produce a powerful supplement to support women’s health. They claim to create it from natural ingredients that are ideal for use. They claim to develop this product with the aim of relieving you from problems associated with menopause. They guarantee you of the safety and effectiveness of this product. Estrofy may work through its ingredients that help to promote hormonal balance. It claims to relieve you from menopausal signs. It might work in synergy with your body to regulate the increase of estrogen hormone to a normal, healthy level. Black Cohosh – It relieves you of menopausal symptoms, anxiety, and nervousness. Chaste Tree Berry – It helps to promote hormonal balance. Dong Quai – It improves your libido, alleviates stress, and relieves you of menopausal symptoms. Estrofy Review – Does it Really Work? The manufacturer claims that this product is an effective product in promoting hormonal balance. However, it is essential to carry out more research on the ingredients to ensure that they deliver the intended results. It helps to promote hormonal balance in females. It relieves you of menopausal problems. It restores a healthy level of estrogen. It improves your mood and energy. Avoid using this product if you are pregnant or if you are under the age of 18 years. Less is known about the quantities of individual ingredients. Take two to four capsules of this supplement in the morning with 8oz of water. You are advised to avoid taking this product without consulting your physician if you have any medical condition, under hormone replacement therapy, or if you are taking any medication. You should not overdose this product. The manufacturer fails to mention the duration it takes for this supplement to deliver the intended results. However, the effects might be noticed by some individuals at a higher rate than others. This is because we are all different and we might react differently to different products. The manufacturer guarantees you of its safety as it contains natural ingredients only. However, if you are allergic to some of the ingredients used, you should avoid this product as it might lead to undesired effects. Also, if you overdose this product, you might experience some side effects. Hormonal imbalance is a common problem for most women especially during their menopause period that occurs at least once in their lifetime. This comes with numerous signs such as hot flashes, mood swings, etc. that are distressing to deal with. The good thing is that hormonal imbalance can be addressed through various ways which include a change of diet or activities. The use of supplements has been a more prominent way of dealing with hormonal imbalance. These supplements promise to relieve you from the signs associated with hormonal imbalance as well as restore the balance. Different supplements tackle these issue via various means. 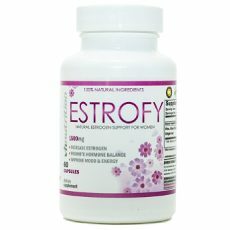 For Estrofy, it promises to restore balance by increasing your level of estrogen to a healthy level. It claims to relieve you of menopause symptoms. However, no matter how a product promise to deliver miraculous results, it is essential to research more about it. By doing so, you will gather more information on its ingredients, how it works, and whether it is clinically proven to deliver the desired results.